Carcinomas in situ are malignancies that are contained within the basement membrane tissue. They are seen as pre-malignant condition, typically found on imaging and are rarely symptomatic at presentation. Ductal carcinoma in situ (DCIS) is the most common type of non-invasive breast malignancy and currently comprises around 20% of all breast cancers diagnosed. It is a malignancy of the ductal tissue of the breast that is contained within the basement membrane (Fig. 2), yet 20-30% of cases (who do not receive treatment) will develop invasive disease. DCIS is often detected during screening, where it appears as microcalcifications* on mammography, either localised or wide spread. This will then be confirmed on biopsy. Any detected localised DCIS should be treated with complete wide excision, ensuring the surrounding tissue of all margins have no residual disease. 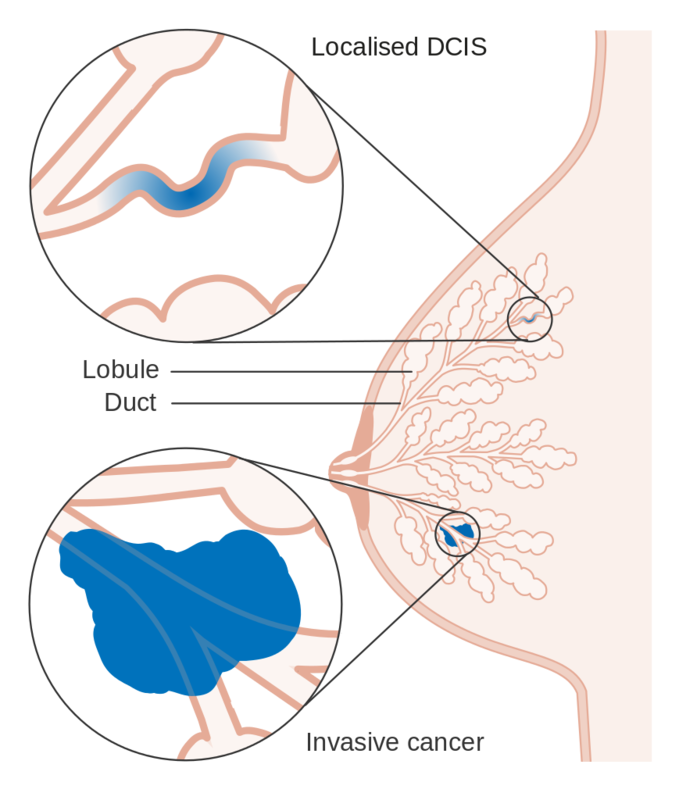 Cases of widespread or multifocal DCIS normally requires complete mastectomy. 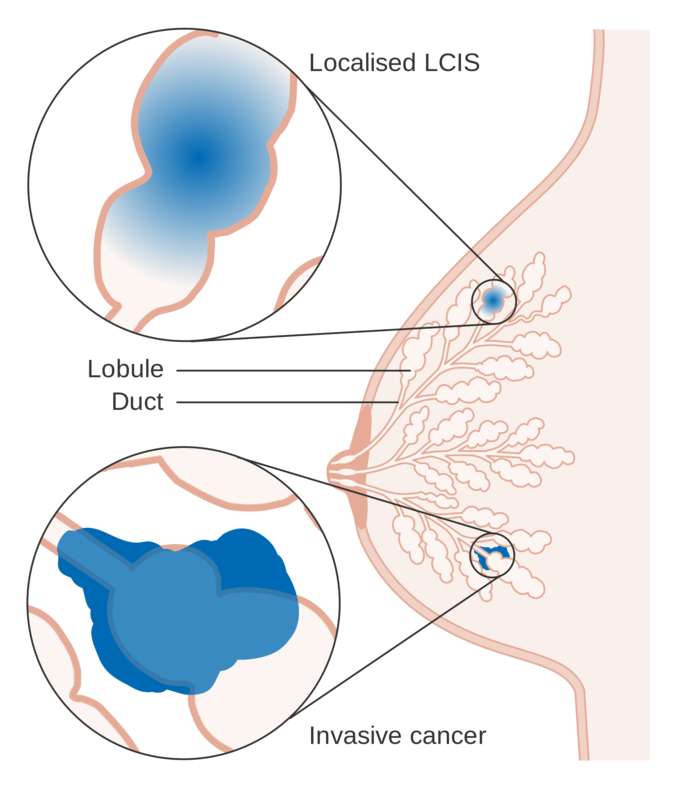 Lobular Carcinoma in Situ (LCIS) is a malignancy of the secretory lobules of the breast that is contained within the basement membrane (Fig. 3). They are much rarer than DCIS however individuals with LCIS are at greater risk of developing an invasive breast malignancy. LCIS is usually diagnosed before menopause, with less than 10% of women diagnosed being post-menopausal. LCIS is usually asymptomatic, much like DCIS, however LCIS is not associated with microcalcifications but instead usually diagnosed as an incidental finding during biopsy of the breast. Management of LCIS is dependent on extent of disease. Low grade LCIS is usually treated by monitoring rather than excision. When an invasive component is identified, it is less likely to be associated with axillary nodal metastasis than with DCIS. Bilateral prophylactic mastectomy can be potentially indicated if individuals possess the BRCA1 or BRCA2 genes. How does DCIS typically present? A 24yr female presents to clinic reporting a breast lump, what is the most likely diagnosis? How is low grade LCIS best managed?